How can Automation and AI remodel your businesses? HomeBusiness SolutionsHow can Automation and Artificial Intelligence remodel your businesses? 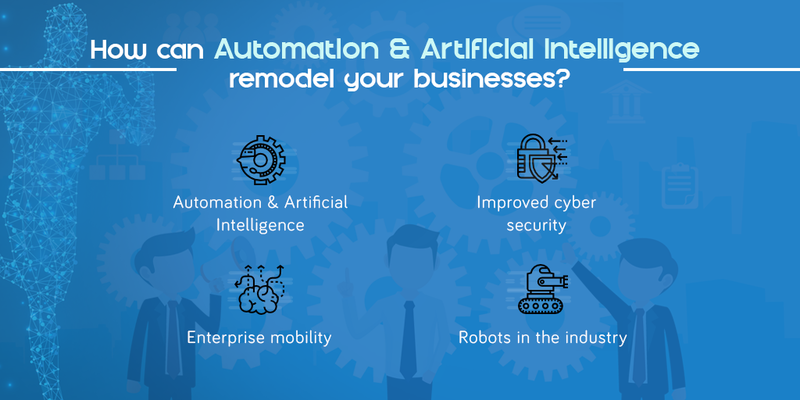 How can Automation and Artificial Intelligence remodel your businesses? With artificial intelligent Bluetooth speaker, intelligent mobile apps, Self-driving cars and robot receptionist, it has become quite obvious that technology has exceeded humanity. Automation and Artificial Intelligence is set to revolutionise the way we live and work. Rather the integration of both has increased the efficiency, safety, security and opportunities in almost all the fields concerned. Automation is using the hardware and software to get the things done automatically. They exactly do what you want them to do and thus set you free from all the boring, repetitive and unproductive tasks in your life. Artificial Intelligence is using the software to find a solution to problems that usually needs human understanding. The focal point of Artificial Intelligence is its ability to learn whereas automation functions on repetitive tasks and simulation. Indeed, the technologies are different but then they complement each other well. Robots in the industry: Manufacturing and other large scale industries have started adopting AI and automated robotics to increase the precision and productivity. The combination of both is not just replacing humans but also giving hopes to the industry, where finding the labour has become a task in itself. Zara has built 14 highly automated factories in Spain where robots look around the work, allowing the company to follow its just in time inventory approach. The technologies will also take over the receptionist and customer care jobs. Enterprise mobility: A central working office model with the freedom to work from any location is the future of businesses. The evolving AI solutions will give freedom to employees to control their environments and deliver better results. The employee will now be able to contribute to a business operation or problem even from his home. He need not visit the location to solve the issue or need not physically attend the training to become more competent. Higher precision and increased efficiency: With the development of automation and artificial intelligence the businesses will now be able to enjoy the higher precision and increased efficiency as the chances of error, risk and inefficiency will reduce to a great extent. The technologies are able to process large sets of data in a much faster way resulting into a logical strategy and planning for the growth of the business. Further, these smart machines don’t require to be paid again and again. Thus, saving a lot of cost for the businesses to reinvest. Consolidating and integrating business operations: Large scale businesses have a common problem of scattered operation and a bad synergy in them. The modern technological solutions or computing abilities can combine all these fragmented parts together after analysing them individually. This result in well-coordinated employees, systems, operations, working and better outcomes. Improved cyber security: The learning ability of Artificial Intelligence has come up as a great promise to fight cyber attacks and find loopholes in security. The technology can learn patterns of networks, devices, systems and decode deviations that indicate an approaching attack. In fact, there are many new start ups are budding based on this because this technology can really ensure better data and information integration for the businesses. Tech Moguls like Google, IBM, Facebook and Microsoft have already invested in this field, indicating us that future definitely belongs to Automation and AI.